A development of 2 new two-storey student residence buildings, each comprising of 12 four-bed dormitories, shared amenity spaces, quiet study rooms, day room, kitchen and lounge, as well as two house parent apartments. 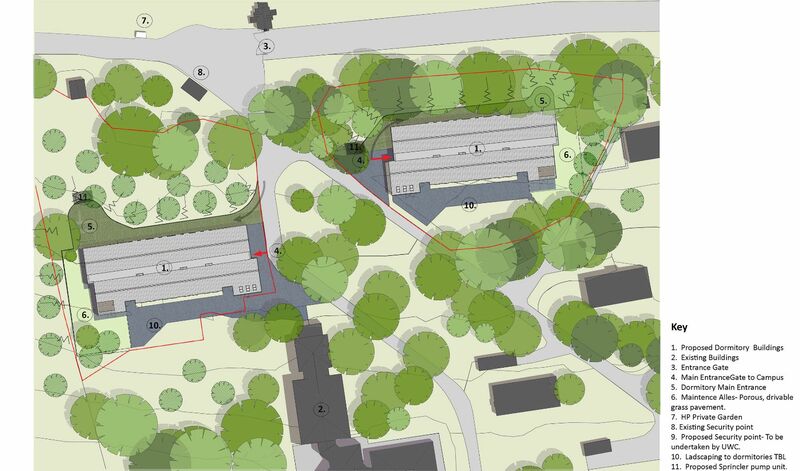 The new buildings are located on the 12th Century St Donat’s Castle campus which includes 18 Grade I and Grade II listed buildings, Tudor terraced gardens and ancient woodland. It is also a site of special historic interest. The acute sensitivities of this unique setting demanded a fully-considered design approach in order to justify the proposals, including the presentation of a Historic Impact Assessment to Cadw during the planning process. The building’s designs are based on the form and scale of the traditional Welsh Long House but more contemporary in terms of material finishes and detailing. Large areas of glazing maximise natural daylight to the internal spaces, particularly the shared day rooms, and also promote views across the historic landscape. The design has been carefully developed to pay deference to the special campus context and strengthen the sense of place, whilst creating a bold and modern architecture which reflects the college’s future visions and aspirations.